Perhaps the name is a bit too casual? If you’re looking to experience a succulent Italian dinner, gourmet style and in a posh ambience you must head to the beautiful hotel of Fairmont, located between the bridges. The opulent works at the grand entrance will surely engage you into exploring the premises, especially at day when the pristine waters of the pool and sea will behest you to stay. Beyond the lobby, a descending staircase will lead you to several doorways – restaurants, cafes, nightclubs and hangouts, from which Frankie’s was one of them in the corridor to the right. The name, is a collaboration between the horse jockey – Frankie Dettori and Marco Pierre, the latter of which is well known and respected in the culinary world. The entrance is plush, and well-mannered attendees present you with their assiduous service. I do not know how they manage to boast of an open pizza kitchen while maintaining a well air conditioned restaurant. The pizza premise is an open invitation for all those who would swap their pastas for a mouth-full of pizza I suppose. Either way, it was fun to watch, with the chef meticulously rolling out his dough, glazing it with sauce and toppings, only to put it in the oven for few minutes and pronto! you have a steaming aroma of goodness among bubbling hot mozarella. Hungry yet? Organ music promptly followed midway through our meal. Clearly, as we surveyed the customers, this was a quiet place for lovers, young and old romantic couples alike. Our order was Fried Calamari for appetizers, followed by Seafood Platter for the main course – the special for the day. Fresh bread was served along with our starters with three of our favorite dips – olive, pesto and tomato. 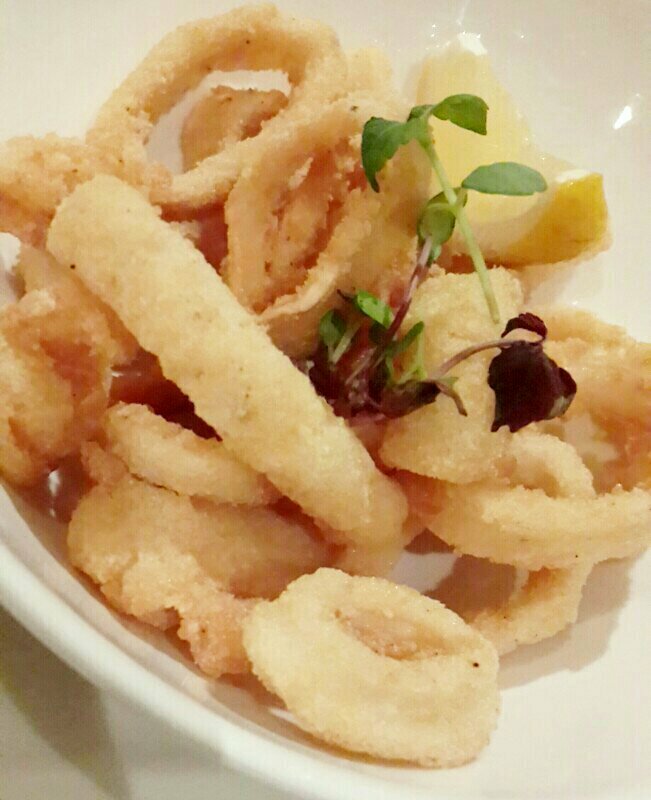 Calamari Fritti was served with tartar sauce and salad cream. 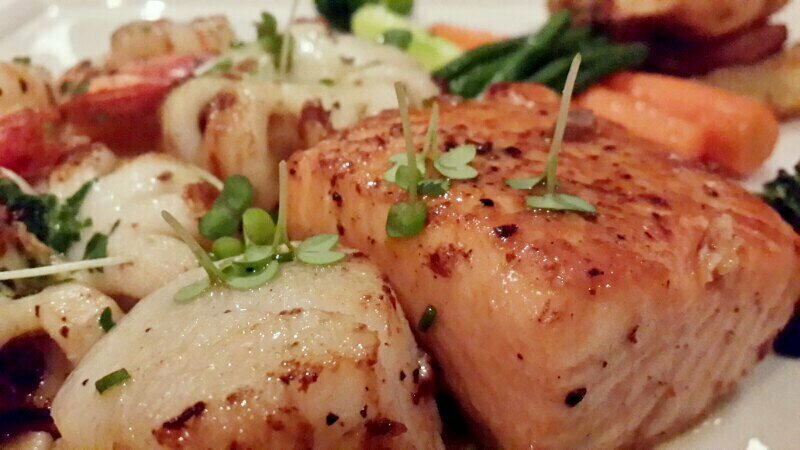 Our main course was a generous spread of Grilled Calamari, Jumbo Shrimps, a cube of Grilled Salmon and some Scallops, along with steamed asparagus and some fried potato wedges. The taste was as excellent as the service. As I always say, never exit an Italian place without tasting the true essence of Italy – Tiramisu. 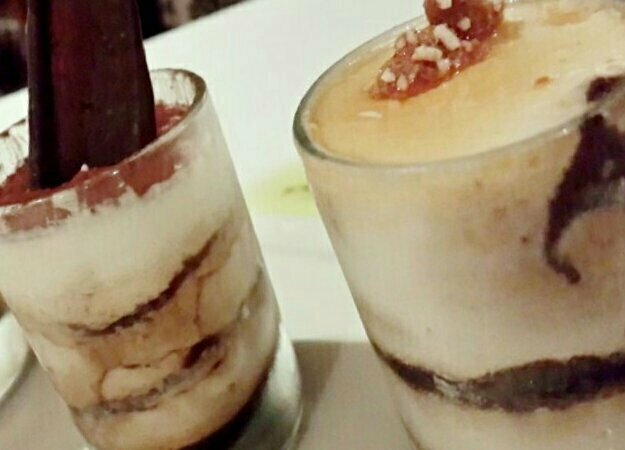 I have heard much about its famed preparation: The Tiramisu Trio as it is known, and has three glassed servings of awesomeness – Amaretti, Classic (for chocolate lovers) and Amarena (rum lovers). The experience was ever fulfilling. It is recommended to reserve a table in day in advance, as the place can get crowded on weekends, and definitely you do not wish to miss this dessert. 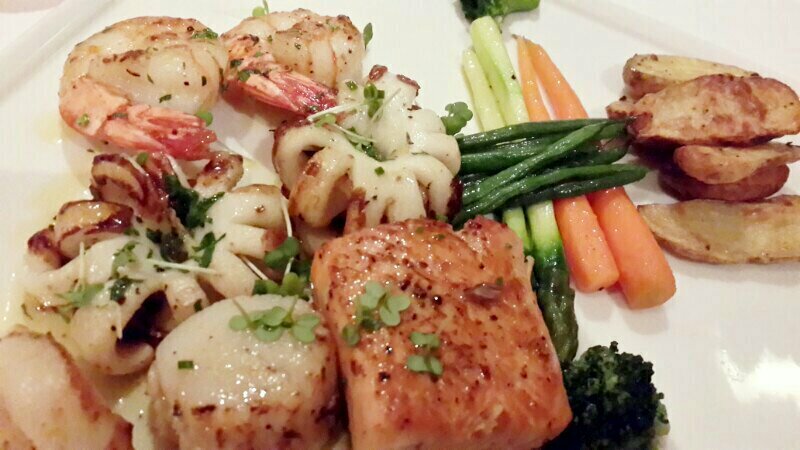 The Seafood platter is AED 225 excluding service tax and tourism fee (16%). Wine and spirits are also served at the restaurant.